In a Nutshell: Genisys Credit Union began in 1936 serving General Motors employees at the Truck & Coach plant. Over time, Genisys expanded to serve all of Michigan and parts of Minnesota and Pennsylvania, becoming one of the nation’s largest credit unions. Much like Detroit’s automotive industry, Genisys emphasizes quality, value, and security in all of its savings, loan, and credit products. For example, the credit union’s two Mastercard® offerings, the Genisys Rewards Mastercard® and the Genisys Platinum Credit Mastercard®, come without fees for annual membership, balance transfers, or cash advances, and sport competitive low rates. What’s more, the Rewards Mastercard® offers valuable DoublePlay Rewards points on every purchase. And it all comes with free access to the CardNav mobile app, which gives users control over spending and security settings from anywhere. The mid-1930s saw a surge of skilled factory workers flood into Detroit in search of automobile manufacturing jobs. General Motors, one of the largest employers in the city — and the entire country, for that matter — was a popular company among these workers. GM’s high wages and constant hiring put money in the pockets of men and women who couldn’t find jobs in other parts of the country. T&C Federal Credit Union opened in 1936 to provide financial services to GM workers at the Truck & Coach plant. The organization continued exclusively serving GM employees and their families for 66 years before T&C converted to a community charter in 2002, opening its doors to everyone in Oakland County, Michigan. In 2008, T&C Federal Credit Union merged with USA Credit Union. USA Credit Union was originally formed to serve employees of Burroughs Corporation, which changed its name to Unisys Corporation in later years. To recognize the origins of both credit unions, a new name was chosen at the time of the merger of these two equal-sized credit unions. The Gen- from General Motor was combined with the -isys from Unisys to become Genisys Credit Union. Today, Genisys membership is open to anyone who lives, works, worships, attends school, or owns a business — as well as their relatives — in the entire state of Michigan, and select counties in Minnesota and Pennsylvania. While Genisys has undergone some changes over the last century, one thing has remained the same: the credit union’s focus on its customers. Genisys works to provide quality, security, and value in all of its offerings, which includes ensuring customers get the full-service features they expect. The institution offers robust smartphone apps, versatile online banking, 30,000 fee-free ATMs, a customer-focused contact center, and 31 branches to serve its members. And, to meet the needs of so many diverse members, Genisys offers diverse products, including two strong credit card options. 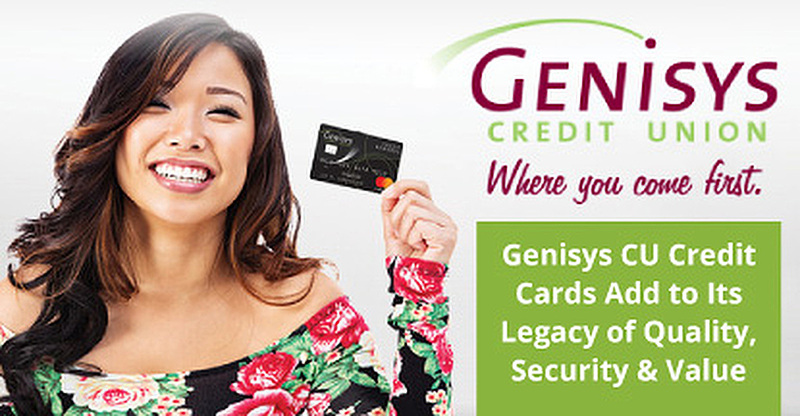 While each card is aimed at a specific type of cardholder, Genisys Credit Union members really can’t go wrong with either choice. Both the Genisys Rewards and Platinum Credit Mastercards each offer benefits, such as low rates and high credit limits, along with perks such as free identity theft resolution service, auto rental insurance, extended warranty insurance, and $500,000 travel accident Insurance. Another popular feature of both Genisys credit cards is the lack of a balance transfer fee, which allows cardholders a convenient way to consolidate high-interest credit card debt onto one lower-rate card. In comparison, a typical balance transfer fee could cost up to 5% of the total amount transferred. The highlight of the Genisys Rewards Credit Mastercard® is its automatic enrollment in DoublePlay Rewards, which offers one point for every dollar of net spend on the card. Cardholders can redeem points for travel, gift cards, and merchandise. “And members who enroll in our DoublePlay Rewards program can combine both credit and debit card transactions for additional points earning power,” Mattson said. Points can be redeemed automatically through Genisys online banking. Beyond rewards, the card charges no fees for membership, balance transfers or cash advances, and sports an APR between 11.99% and 18.00%, based on creditworthiness. The same APR applies for balance transfers and cash advances, which is rare in today’s credit card market. The Genisys Platinum Credit Mastercard® doesn’t offer rewards, but the card more than makes up for that with its competitive interest rates. Starting at 9.99% for new purchases, cash advances, and balance transfers, the Platinum card’s regular APR is hard to beat. In fact, its low rate makes it ideal for consumers who occasionally need to carry a balance from month to month, or who may need to transfer a balance from a card with a higher interest rate. Beyond its remarkably low APR, the Platinum card charges no annual fee, and it comes with a long 28-day interest grace period. Additionally, while late payments will result in a fee of up to $25, it won’t result in an APR increase, a nice change of pace from most big-bank card offerings. While both the Genisys Rewards Mastercard® and the Genisys Platinum Credit Mastercard® offer great card features, one of the best perks of a Genisys credit card is actually the credit union’s advanced CardNav mobile application. Taking full advantage of modern banking, the app combines convenience and security to give members total control over their card’s functions. 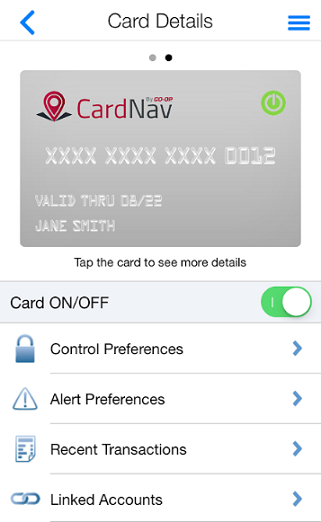 The Genisys CardNav mobile app gives cardholders the ability to turn their cards on and off on the go. Worried your card might fall into the wrong hands? With CardNav, members can receive real-time alerts to potential Identify fraud, as well as the ability to turn a card on or off at any time right from the app. Cardholders can also set GPS-defined location limits to determine where their card works, as well as set transactions and merchant-type preferences that exclude various transaction types or merchants. The app can also be used to track and control your credit card spending, allowing you to adjust spending limits in real time. Cardholders can also receive location, usage, and credit limit alerts on their devices. While CardNav currently operates as a separate application that Genisys members can download from their favorite app store, the credit union has plans to integrate it into the main mobile app this summer. The app is free to download and works on virtually any mobile device and operating system. Genisys CU’s original mission focused on supporting General Motors employees during Detroit’s automotive heyday. Those roots now extend throughout all of Michigan and parts of Minnesota and Pennsylvania. Today, more than 200,000 members have a combined $2.3 billion in assets under management by the institution, making it one of the largest credit unions in Michigan. The nonprofit Genisys returns that loyalty by supporting the communities within its footprint. In 2017 alone, the credit union sponsored nearly 900 community events and its employees, along with their family and friends, volunteered nearly 4,000 community service hours. The institution posts a calendar of events it sponsors on its website, which includes family-friendly concerts in the park, as well as community farmers markets and special nighttime events at the Detroit Zoo. Since its early days to its renaissance, Genisys has been a strong supporter of the communities it serves. Along the way, the credit union’s savings, loan, and credit products have helped individuals and businesses in Michigan, Minnesota, and Pennsylvania continue to grow and thrive in ways the automotive industry once did in the 1930s.